More traffic disruption's ahead for drivers in Houghton Regis this weekend - as part of prepation work for the new Woodside Link. 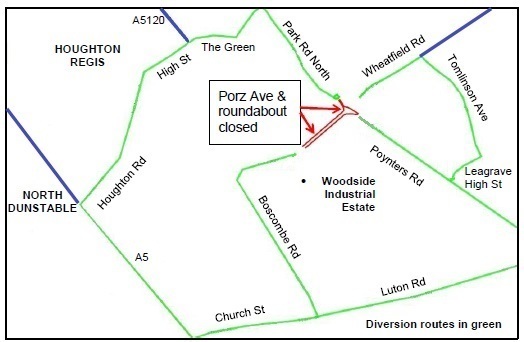 Engineers say the Porz Ave roundabout will be closed from 5am on Saturday (22nd Oct) to 30th October. It's to allow engineers to complete essential work on the Woodside Link road scheme. Signed diversions will be in place. These diversions are indicated on the map above this item, in green. Traffic heading south towards Porz Ave roundabout from Park Road North: go around the smaller roundabout, back up Park Road North, along High Street and Houghton Road, down the A5 and back down along Church Street and Luton Road to reach Poynters Road. Traffic approaching from the industrial estate: go back down Porz Avenue, down Boscombe Road towards Luton Road, then left to Poynters Road or right to A5. Traffic approaching from the east on Wheatfield Road: go down Tomlinson Avenue, then take Leagrave High Street to arrive at Poynters Road. To change the shape of the roundabout so it will connect properly to the Woodside Link. Engineers will also close off the end of Wheatfield Road so it becomes a cul-de-sac. Is the roundabout closed 24 hours during this period? Why can’t one lane at a time stay open? There are three main reasons why we can’t keep one lane open. Why is the roundabout closing for so long? It will take nine days working from 7.30am to 7.30pm to complete the work including Saturday and Sunday. It makes sense to close the roundabout for one period rather than for several weekends in a row.